Have you ever wanted to identify the exact position of the sun and moon? There are GPS devices that could help you do that. Sun Surveyor is also quite a useful tool to use to handle this job. 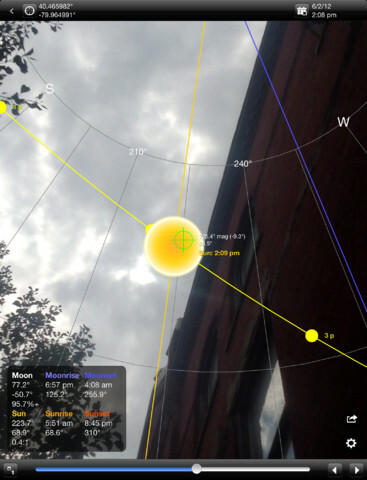 This app runs on your iPad and provides you with sun and moon positions with an augmented reality view. It provides you with rise/set, twilight, and Golden/Blue hour times. Sun Surveyor provides you with all kinds of useful information on the sun and moon. For starters, it shows you altitude, bearing, rise/set times, shadow ratio, phases, and illumination for these objects. It also covers twilight times, solstice paths, and Golden/Blue Hour times. You get a 3D compass with an augmented reality view. Just point your tablet to the sky to see the position of the sun and moon. Sun Surveyor also has a Time Machine so you can visualize past events on your tablet. You don’t need an internet connection to use this as long as you have the locations you want to track. Its timezone can be set automatically or manually. 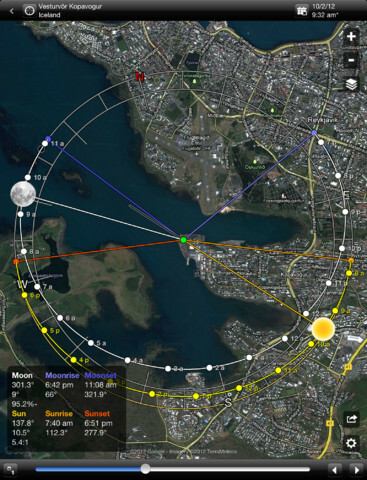 Sun Surveyor is a pretty decent sun tracker and looks quite elegant too. 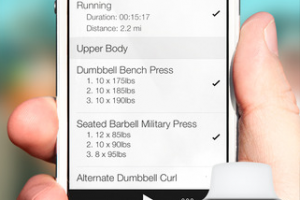 It works pretty well on iPhone too. The app has a lot of potential.